In the older, northern half of New Delhi, the streets are full of life and enterprise: a busy roundabout transformed into a cricket pitch by a column of bricks hosts a dozen lads’ game, strangers spotting and intercepting you in the street to propose a tourist tour. Though some advances are without agenda, just friendly and kindly intended, either way, and more often than not, the encounter ends with smiles. Making ends meet seems alarmingly hard in the world’s third most populous city. This evening’s restaurant had eighteen covers, three diners and more than ten staff and my small hotel’s reception has six in attendance. 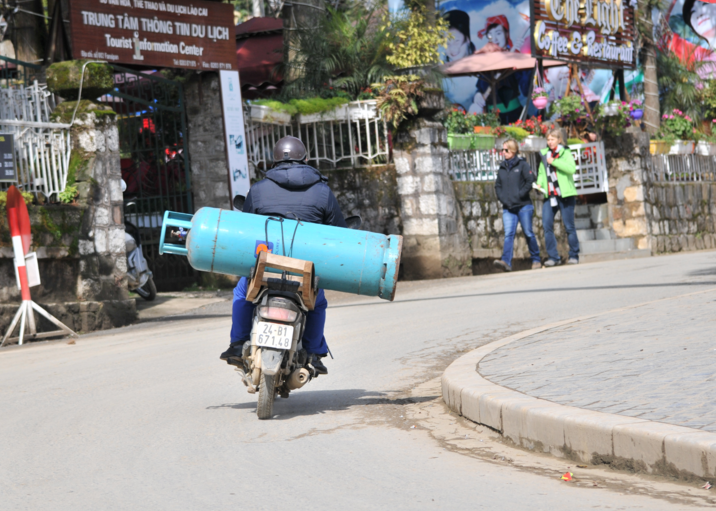 It is hard to understand gas bottles swinging precariously off the back of a scooter with so many industrious and enterprising people about. But maybe that’s just it. Everyone’s too busy doing it for themselves to establish a national, franchised, gas distribution network with a fleet of customised vans, branded outlets and consistent marketing. Maybe that’s not how these people want to do things – who’s to say? London teems too, but more discretely: vehicles on roads, people in pedestrian zones, demarcating shop fronts. There are no monkeys squabbling over bananas by the roadside, no free ranging dogs and cows, no courtyards disgorging half a dozen domiciles onto the street, no rickshaws or motorbikes piled high with foam padding out the pavements, no shopkeepers holding court outside their premises, or the cacophony of horns. But here in equal measure are both an awful beauty and intense vitality. December 30, 2015 in India 2016. That is one hell of a gas bottle! A rocket booster for the Indian space program perhaps? Nitrous oxide injection for the moped?..